At chess tournaments you sometimes see human players competing with computers. 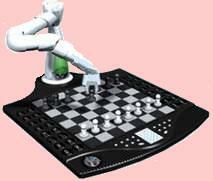 Now that chess computers have become so good at chess , we may easily forget that twenty-five years ago hardly any serious chess-players lost against computers. But it's a computer of twenty years old and as you will see, there is a world of difference between this machine and a modern (not too expensive) chess program. In the following two games you'll see the computer avoiding the loss of a piece by sacrificing a minor piece. The computer doesn't see that it's going to lose the major piece anyway, but since the computer cannot look further than one move, it dooesn't see this loss. This is often called the horizon effect. Since the Acetronic computer hadn't got a chance, I gave it much more time in the second game. Let's see if it gets any better. Seeing games like this, you can imagine why twenty-five years ago many chessmasters thought computers would never be able to play chess.